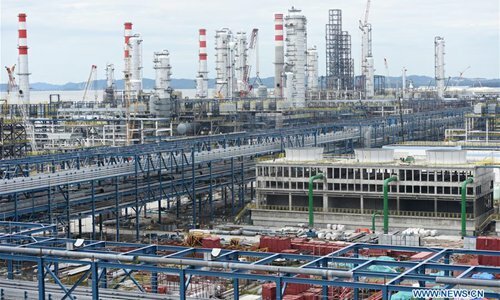 Pulau Muara Besar (PMB), or Great Muara Island, a tiny isolated island northeast of Brunei's capital city Bandar Seri Begawan, is undergoing a profound change as it develops a modern petrochemical complex. The cooperation project between China's Zhejiang Hengyi Group Co. Ltd. and the Brunei government is aimed at helping the Southeast Asian country upgrade its industries, alleviate its reliance on oil exports and boost bilateral economic and trade cooperation. Brunei, an oil-producing country, has an economy heavily dependent on the global crude oil market, with oil prices directly affecting the sultanate's gross domestic product (GDP). Influenced by international oil prices, Brunei's GDP has fallen for four consecutive years from 2012 to 2016. Facing a sluggish economy, the Brunei government has put forward policies to diversify its economy away from oil and gas exports. 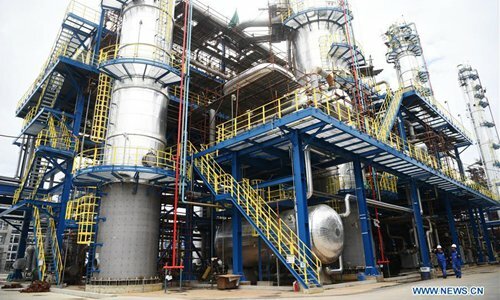 Hengyi, a company from east China's Zhejiang province, came to the country with a solution, which is to build a modern oil refinery on PMB and help the country export refined products. 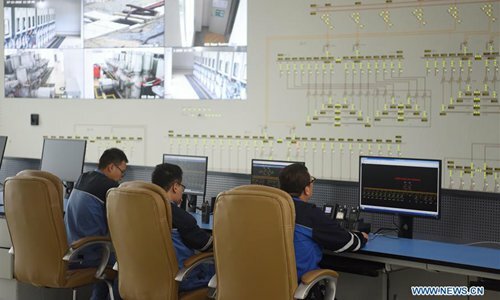 Chen Liancai, chief executive officer of Hengyi Industries Sdn Bhd, told Xinhua that the first phase of the project on PMB, with a total investment of some 3.45 billion U.S. dollars and a crude oil refining capacity of 8 million tons per year, will be put into operation in the first half of 2019. "After the completion of the first phase, the project can supply some 1.5 million tons of p-Xylene to the Chinese market every year, while other products will first supply the Brunei market and then sell to other countries and regions," he said. He added that one third of the crude oil used in the refinery will be from the oil-producing sultanate itself, while the rest needed will be imported from other countries. The project will help Brunei become a hub for crude oil refinery and refined product export, making it more competitive in the future to deal with risks in global markets once its oil runs out. The project on PMB started construction in March 2017. At the construction site, the first phase covering an area of 375 hectares is taking shape. Oil storage tanks and liquefied petroleum gas spherical tanks are lined up at the site while different kinds of pipes are also installed in order. Power stations and water supply and sewage treatment works are almost complete. However, before the construction started, the island was almost uninhabited and covered by tropical forests and swamps. Though it is not far away from Brunei's mainland, the only means of transportation at one point was by ferry. Hengyi had to work from scratch. "Besides the harsh working environment, another problem we faced was which standard the petrochemical project should apply, whether a European standard, U.S. standard or Chinese standard," Chen said. The company has done plenty to convince its Brunei partner to apply Chinese standards, for the most part, after a third party agency examination discovered that Chinese standards are equivalent to or even higher than their foreign equivalents. The PMB project has thus become the first Chinese petrochemical project abroad that holistically applies Chinese standards. Many kinds of equipment, including steel, pipes, spherical tanks, among others, were delivered to the island ... a holistic petrochemical industrial chain is taking shape here. The Brunei government has attached great importance to the project, setting up a specific committee with several ministers being its members, and the government has also invested in building a bridge linking PMB with the mainland. "Since the Brunei side attaches such great importance to the project, we know if we cannot do it well, it would affect the reputation of Chinese industry, so we have to do our best," Chen said. Besides building a whole petrochemical industrial chain in the country, the project on PMB will also develop a batch of Brunei technicians, which may contribute to the localization of the project and job creation. According to Chen, Hengyi has cooperated with Zhejiang University and Universiti Brunei Darussalam to develop human resources and specialists. Students of Universiti Brunei Darussalam can choose to learn petrochemistry at Zhejiang University for a year and intern at Chinese petrochemical companies and then join the project to work here on PMB. There have already been six batches of 80 Brunei students in total joining the joint education program. DK Seri Liyana was in the first batch and went to learn chemistry and the Chinese language in 2014, after which she took internships in China for half a year. "It was my first time to get to know Chinese chemical technology. Though it is different in some way from that in the West, it is also safe and advanced," she said. She has now been working in Hengyi for almost two years. Twelve students took the program along with her and they are now her colleagues. "I love my job. I feel respected here and I am contributing to the development of my country." Apart from technicians, Hengyi also works with Lanzhou Petrochemical College of Vocational Technology to train future workers and also cooperate with Sinopec to train fire-fighters. 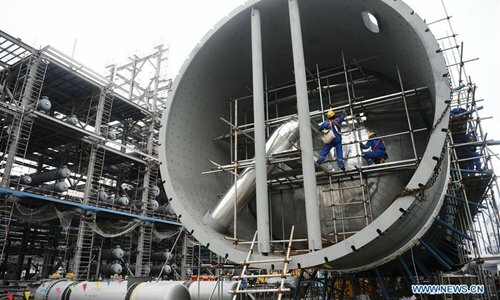 In China, petrochemical companies usually hire other companies to do equipment checking and repairing. It will be the same here on PMB, and there will be a special factory using local staff to do the job. According to the plan, Brunei employees will account for 80 percent of total staff in the final stage. With the first phase nearly completed, a second phase, much larger than the first, and with an estimated investment of 10 billion dollars and an additional oil refining capacity of 150 million tons, will dramatically expand the scale of Brunei's refining capacity. 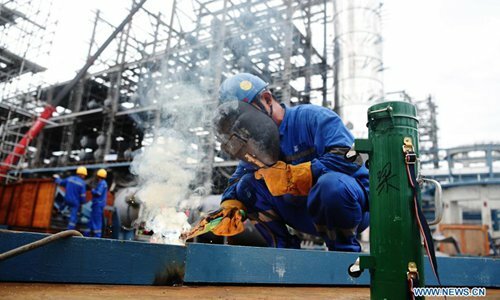 A modern petrochemical island applying Chinese petrochemical standards will finally rise along the shore of Brunei, contributing to the long-standing prosperity of the Southeast Asian country.